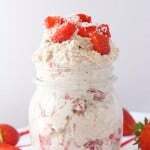 So easy to make and super healthy, these Strawberry Shortcake Overnight Oats honestly taste like strawberry ice cream and are sure to be a hit with the kids! Chop the strawberries into small pieces. If you are using frozen strawberries defrost them quickly by placing them in a bowl of boiling water for 2 minutes. Place the chopped strawberries in a bowl and mix in all the other ingredients. Stir well, cover the bowl and place in the fridge for a minimum of one hour. When you are ready to eat them, simply remove from the fridge and decorate with your choice of toppings. The oats can be eaten cold or else heated in the microwave for 30-60 seconds. The oats will keep in the fridge covered for 2-3 days.